Friday December 9th 1892 I helped do up the work. Will took me over to see how Mrs Halson was before dinner. I spent the afternoon and evening at home at work. Lee came home today. Saturday December 10th 1892 I was busy all forenoon getting up the dinner and helping with the ironing. Ott, Fanny & Edith was over for dinner and Hattie was over in the afternoon. I was knitting some. Sunday December 11th 1892 I helped with the morning work. Josie went to church. The boys put up the stove in the parlor bedroom and I worked the whole afternoon moving things around. Will went over to Woolfs in the afternoon. I was so tired I sat down to read. Monday December 12th 1892 We did washing and churning before dinner. I went to town in the afternoon. I did a little shopping and spent the rest of the time at Hatties till Will came for me at nine oclock. Tuesday December 13th 1892 It snowed the entire day. I was not away from the house. We got part of the ironing done. I was busy with knitting and working on lace. Fanny was to go home today. Wenesday December 14th 1892 We were busy with the work all forenoon. Soon as we ate dinner Will took us all to town in the big sled. I spent the afternoon at the church. Father & Mother did not come back. Thursday December 15th 1892 Will brought Mary Woolf and Jennie over this morning and Mary and I went over to see Mrs Halson before noon,. Soon after dinner Will took us all over to see Mrs Sue Smith. We stayed till four oclock. We took Mary and Jennie on home. Josies Mother and sister Anne was here for dinner. 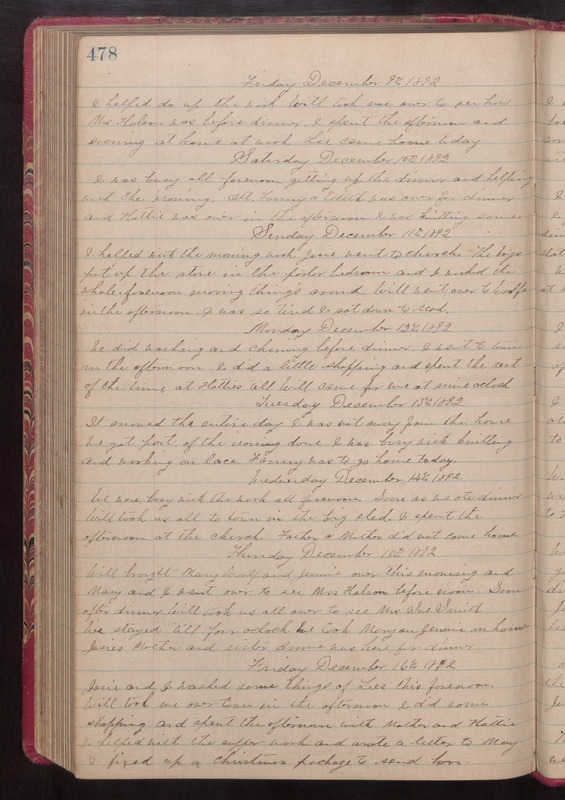 Friday December 16th 1892 Josie and I washed some things of Lees this forenoon. Will took me over town in the afternoon. I did some shopping and spent the afternoon with Mother and Hattie. I helped with the supper work and wrote a letter to Mary [May?]. I fixed up a Christmas package to send her.